From Quick to Crazy Fast ! A naturally aspirated 412 horsepower isn't enough? Maybe a 2011 Roush supercharger will fit the bill. While nobody's been complaining about the performance of the new 2011 Mustang and it's fantastic new 5.0 Coyote engine, there are some folks that just crave more power. And if you're one of them, then you're probably familiar with the name Roush. You've probably also wondered out loud about how much fun those new 5.0 coyote engines would be with blowers. And pushing 550 horsepower and 470 pounds of torque on pump gas! In comparison, a 2010 Roush 437R Mustang, with the 4.6 liter V8 and Roush supercharger treatment, puts out 435 horsepower and 400 lbs of torque. From the latest dyno tests on the new 5.0 coyote, this is a pretty safe and mild increase. ( see the Powerblock dyno results ). In fact, with a bit more work to this engine and supercharger combo, you can realistically expect more than 600 horsepower. 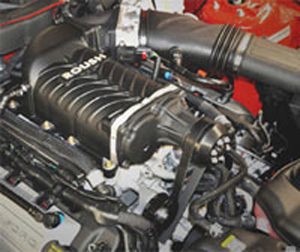 The 2011 Mustang Roush supercharger kit, is based on the TVS2300 Roushcharger. There's a 90 day parts warranty for parts only. Be aware that the current kit does not include a pcm calibration, or maintain the factory warranty. Later this fall, Roush is expected to offer both, calilbration kit and warranty. Note: Additional pulley sizes for changing available boost, will be offered later as well. If you'd like the performance, but prefer it to come complete with car and factory warranty, check out the Roush Mustangs section.